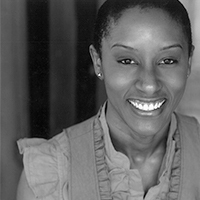 CELESTE M. COOPER made her Court Theatre debut in Blues for an Alabama Sky and also appeared in The Hard Problem. Some theatre credits include: Our Lady of 121st Street (Eclipse Theatre), Measure for Measure (Goodman), Stick Fly (Windy City Playhouse/nominated for Best Featured Actress from BTAA), Never the Sinner (Victory Gardens), Ruined (Eclipse/ensemble member/casting assoicate/BTAA Most Promising Actress receipient), Animal Farm (understudy, Steppenwolf), The Hammer Trinity (House/Adrienne Arsht in Miami), The Mecca Tales (Chicago Dramatists), How We Got On (Citadel), and her original one woman shows Fight 4 Your Life, and later The Incredible Cece (MPAACT & Stage 773). Some TV/Film credits include a recurring role on Chicago PD (NBC), Spike Lee’s Chiraq, and Sense8 (Netflix). Ms. Cooper has a BA in Speech Communications and Theatre from Tennessee State University and an MFA in Acting from The Theatre School at DePaul University.